To convert between Julian, Gregorian, Dee and Dee-Cecil calendar dates in various formats, to add/subtract a number of days, weeks, months and years to/from a given date, and to calculate vernal equinoxes using either mean or apparent solar time. Terminplaner 2013 enables you to manage your business and private dates and tasks and to represent them. You are able to get audible and/or visual date notification and to choose state specific calendar and alter it. SysDate shows the day of the month in the system tray (next to the time). This lets you see the current date with just a glance, instead of hovering the mouse pointer over the time. Great timesaver for those who are in front of a computer all day! Change how the position of months, days and years appear in dates in MS Excel. Excel 2000 or higher required. Update file modification dates by days, hours, minutes, or seconds. Specify a single file or all files in a folder. Useful for synchronizing the date and time stamps of pictures taken with multiple cameras. Increase or decrease file times. Free. 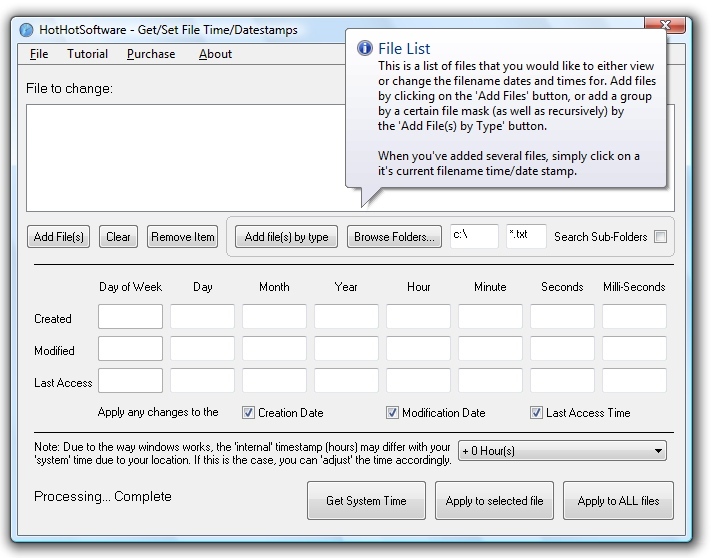 Utility to modify file/folder date-time stamps and attributes, powerful file renaming features. Can set / reset individual attributes, Accessed, Modified and Created dates, shift, mask file date-time, print folder contents. Command line mode. Auto Photo Organizer organizes and renames digital photos by date picture taken, date modified, date created, and extension. The software is compatible with photos taken by major digital cameras. And it is full compatible with Vista and Windows 7. Import file and folder lists from plain text source files and rename multiple files. New names automatically filtered for illegal characters. Edit entries and extensions. Filter files by size, date and pattern and sort by name, date or size. Renames pictures according to the date-time information found in EXIF. All you have to do is to select the folder containing the pictures and hit the button. Features: optional recursive renaming, time correction, append camera model or custom text. IT Outsourcing task tracker is a simple, easy to use tool to track work assignments. Out of the box, it tracks task assignment date, complete date, etc. It also has provision to add more parameters for tracking. Educational quiz game makes learning fun. Teaches State Capitals, Flags, Date of Entry into the Union, State Bird, Flower and Tree. No installation necessary. Runs in your web browser. Includes graphic of all 50 States. Every game is different. Display Day Time Date Month Year FreeMem FreeDriveSpace on right side of title bar in any main window that has the mouse or keyboard focus. Atomic Time sync. Desktop clock. Popup Calendar. Calculates the dates of the legal holidays of every year selected. The localizations northern Germany and USA are supported. Further functions allow for example the calculation of the day of the week to a special date. ASP.NET server controls to provide calendar and date picker functionality. Namexif is a tool to automatically rename photos with the date they were shot. Digital cameras have their own clock and record the date to each photos with a precision of a second. Namexif uses these data to rename photo filenames. A dockable bar that shows you often used information like time, day, date, CPU and memory usage, disk space and internet data speed. You can easily set up QuickStart buttons on NikNak to start your favorite programs saving screen space. Convenient batch processing of photos for printing. Smart import from your camera for easy navigation. Crops images to your desired proportions for aesthetic improvement. Stamps date and time photo was taken to preserve your memories.